$ 4,000.00 and above - Single Sink Vanities Find affordable double vanities with Luxury Living Direct. 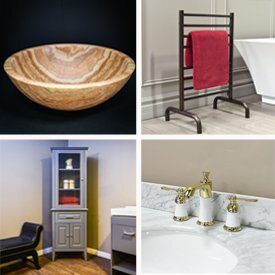 There are many things to factor in when buying a bathroom vanity. From the $ 4,000.00 and above range, you can find an assortment of different styles and finishes. The innovative and creative features our cabinets are high quality and functional. There are many different cabinet installation types to choose from including freestanding and floating configurations which can rejuvenate your bathroom decor with lavish designs. An important thing to also consider is finding a bathroom vanity with higher quality hardware and materials. At Luxury Living Direct, we offer bathroom vanities made from solid oak wood and come with 6-way soft-closing hinges. Bathroom vanities for any budget are available at Luxury Living Direct. Save more when ordering 2 or more vanities. Call us at (800) 574-3022 to get a special multiple vanity discount!